For those of you who are relatively new to Scottish salmon fishing here's a few pointers to assist you with what you should be focussed on after you've hooked a salmon. A salmon landing opportunity is best achieved if you follow this basic advice. The first thing in my mind immediately after contact with a fish is always have the hooks been set properly. Even if you've felt the weight of the fish as mentioned plenty of times in the articles on how to hook salmon in this newsletter I'm always heavy handed with any fish for the first 10 seconds of battle to make certain of a good hook hold. Far too many salmon are lost each year due to the 'illogical' hooking techniques that are often used in Scottish salmon fishing where a good hook set is more often than not left to chance! The most frustrating and unpleasant feeling in the world is a slack line following the adrenalin inducing contact with an Atlantic salmon so best avoided if possible. After ensuring a good hook hold is achieved during the first 10 seconds of battle it's also very important that you maintain sufficient rod pressure on the fish. If you don't do this it's going to be an unnecessarily long drawn out fight which could ruin your chances of a quick double and probably the entire salmon pool too! If you've a good head of fish in front of you steer your fish away from the main taking area to a downstream position if possible rather than shaking up the entire pool. A high rod position with a good fighting curve bend in the rod is the key to playing any salmon as eventually that pressure will tire the fish out in preparation for landing. On the high rod angle salmon fight position I'll add the following; In the old days a low rod position while playing a salmon on the Tay would have seen some pretty stern words (or worse!) being spoken by any of the Tay ghillies I ever fished with. They knew only too well the dangers of a low rod position and that salmon dive when distressed making the main line of contact susceptible to being snagged on boulders or roots instead of safely coming in high from the rod tip to the hook hold. The rod is the shock absorber too against sudden surges from a fish which a low rod position has zero defence against. These days it appears to be 'trendy' to lower the rod during battle but I can assure you this is a foolish way to play a fish for a few good logical reasons. This one is dead simple to understand; If you play a salmon from an upstream position you're also playing the weight of the river and applying hook point pressure in an 'out of mouth' direction. A small hook that got a shallow flesh hold within a salmon mouth won't hold out for long if you play the fish from upstream. Whenever I've seen angler's doing this I completely cringe as I know the hook will get thrown and especially if their rod is also low! Walking down the riverbank and getting 'side on' to your fish will give you control of the fish & the fight and keep the hook pressure in a much safer 'in to' mouth direction. During the excitement of the fight the angler should not only have one eye on the fish but also an eye that is scanning for a good landing area. The perfect area to steer a salmon to (which can be done with a consistent steady pressure) during the latter stages of the fight would be an area of the pool that's out of the main current that has a bit of depth and looks to be snag and obstruction free. Sometimes this can involve walking the salmon down the pool a fair distance but doing so is much safer than attempting to land the fish in a shallow fast stream when the salmon will probably go crazy and use the current to significantly prolong the battle. 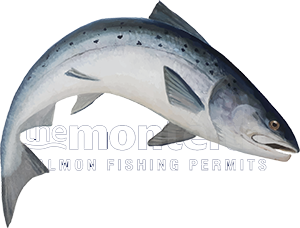 The human mind through excitement often seems to miss an important link whenever a salmon is hooked as in the vast majority of cases the landing net appears instantly a salmon is hooked. An early produced landing net by the angler (or a ghillie) does no favours but only puts the angler under psychological pressure to rush the fight which can easily end in disaster. Leave the landing net alone until the salmon starts showing signs of fatigue at close range and focus on playing the fish correctly up until that point. You'll know when the time is right to land the fish and it's only then a simple case of lifting the pre-sunk landing net after the fish is drawn over it. If an excited colleague or ghillie starts standing with a landing net between you and your salmon soon after the fish is hooked my advice would be to call them back out of the river until the time for landing the salmon is right.